The devastation in Puerto Rico – houses in tatters and tangles of electrical lines and utility poles still lying where Hurricane Maria tossed them – is beyond anything Craig Mustard imagined before arriving on the island with other Duke Energy linemen. “I met a lady the other day,” he said by phone. “She had been out of power for more than 120 days. She lives in the town of Penuelas, up the mountain. It was so hard to get back in there. Trees were down. Poles were down everywhere. 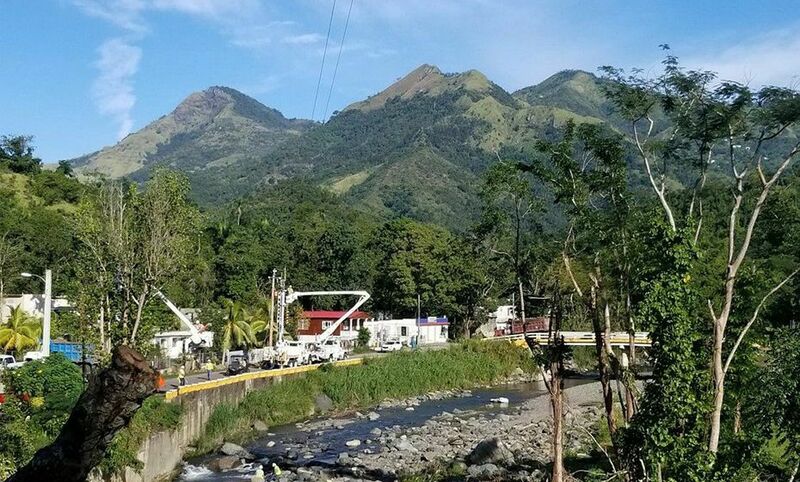 Duke Energy employees are working in the mountains of Puerto Rico to restore power. Mustard is one of 227 Duke Energy workers who answered the call for help in restoring power to the U.S. territory. The volunteers came from the Midwest, the Carolinas and Florida and include distribution and transmission line workers, leadership and support personnel. They flew to Puerto Rico by charter flights Jan. 14, and trucks and equipment arrived by barge the next day. The woman whom Mustard met was among about 450,000 customers living without electricity four months after Hurricane Maria slammed into the Caribbean island with 155 mph winds. Like others without power, she lives in an area difficult to reach because of rough terrain. It took 28 Duke Energy workers four days to restore electricity in her neighborhood, Mustard said. 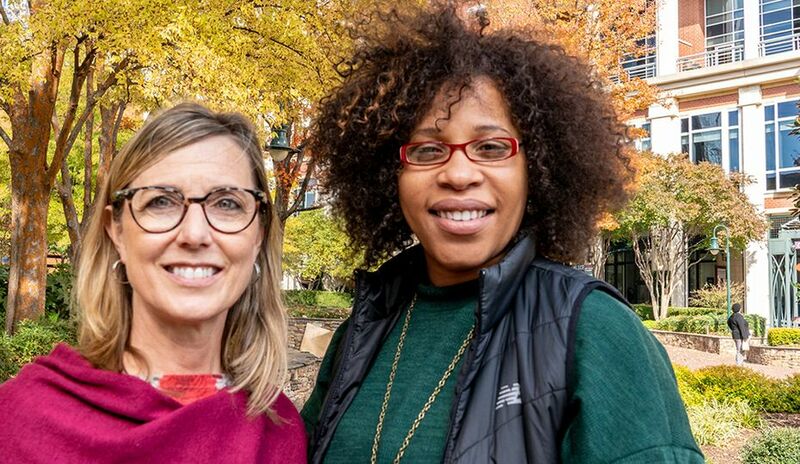 “It was very slow going.” When her husband switched the breaker and their refrigerator began humming again, he said the woman’s gratitude was uncontainable. That type of unbridled joy is what keeps Mustard and others getting up at 4 every morning to start another grueling 15-hour day. 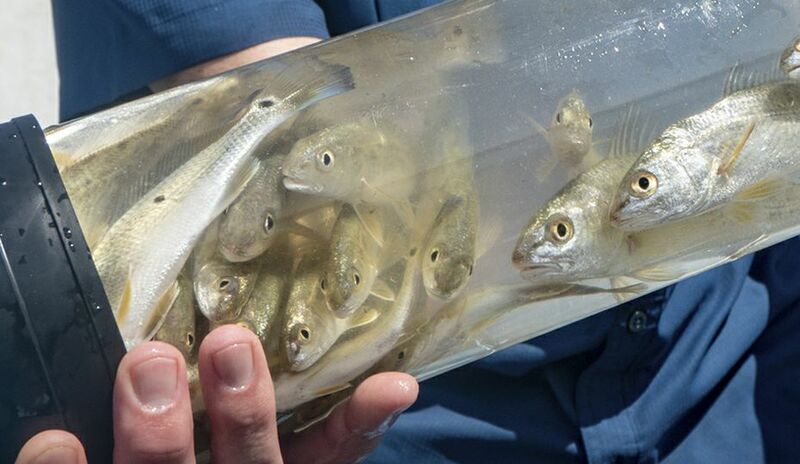 They sleep at a hotel – powered by a generator – in the town of Ponce on the southern coast. They ride a bus to a base camp about 20 minutes away, eat breakfast, pick up a bag lunch and then get to work. 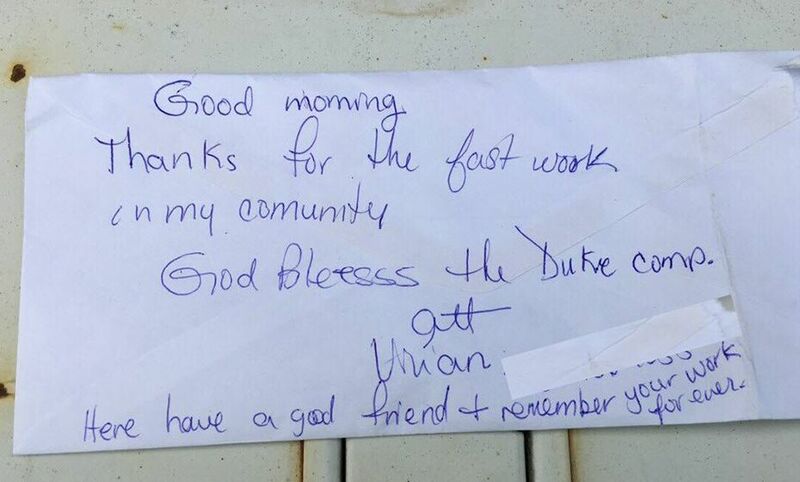 A thank you note to Duke Energy linemen from a Puerto Rican resident. 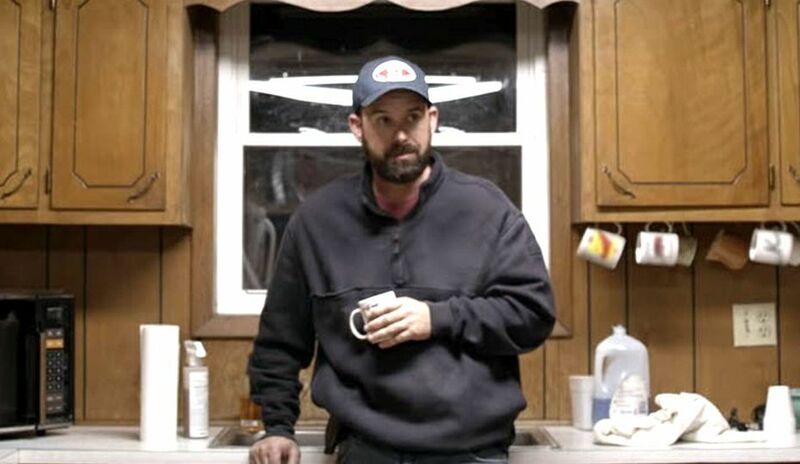 “The terrain is way different from what we have back in Ohio and Kentucky,” said Mustard, 30, a distribution lineman from Lebanon, Ohio. Span lengths – the distance between utility poles – are usually 50 feet to 200 feet in the States. Mike Haynes, 50, a lineman from Marion, N.C., read about conditions on the island before he arrived. He brought a machete. He’s used it a lot. 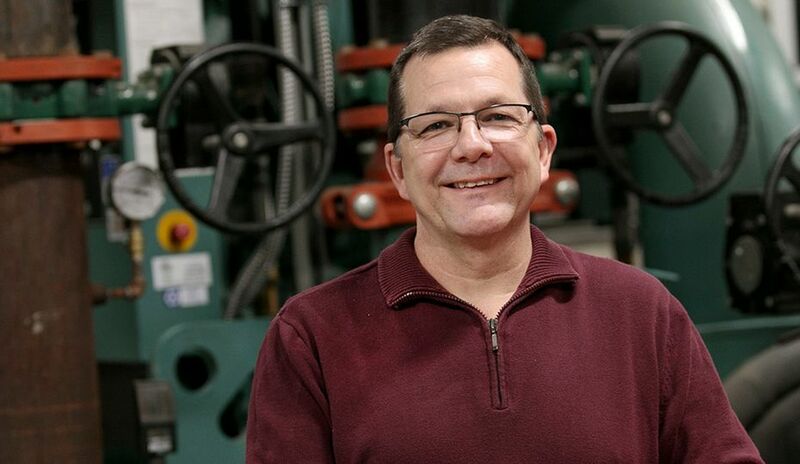 “The huge difference between here and back home, it’s like a rainforest,” Haynes said. “Things are constantly growing. Some of these conductors have been laying on the ground for four months. The growth has overtaken the conductors. We have to tug and cut. 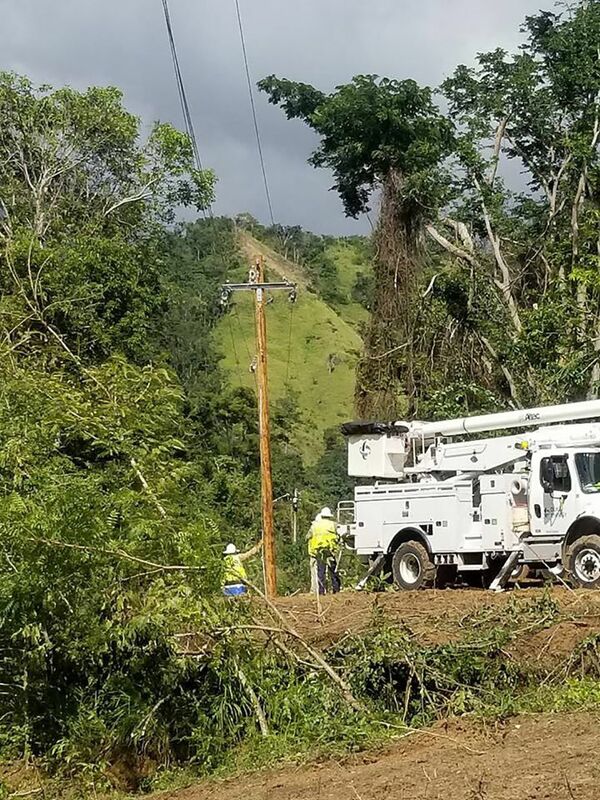 Duke Energy linemen are adapting to difficult terrain in Puerto Rico. And they're successfully restoring power. But just when Haynes feels as exhausted as he’s ever been, something nice will happen. With the addition of the Duke Energy contingent, there are now nearly 1,500 workers from several mainland energy companies. In all, about 5,500 people are working in the power recovery effort, which is being coordinated with the Puerto Rico Electric Power Authority, FEMA and the U.S. Army Corps of Engineers. Duke Energy earlier released 100 contract line workers to assist. “It’s the experience of a lifetime,” said Rufus Jackson, vice president of Distribution, Construction & Maintenance in the Carolinas-East region, who is leading Duke Energy’s effort. The need is so great and the reception from Puerto Ricans so positive, Jackson said, it makes it easier for linemen to get back to work every morning. They are working in an area about 50 miles long where many residents live high up in mountains thick with forests. 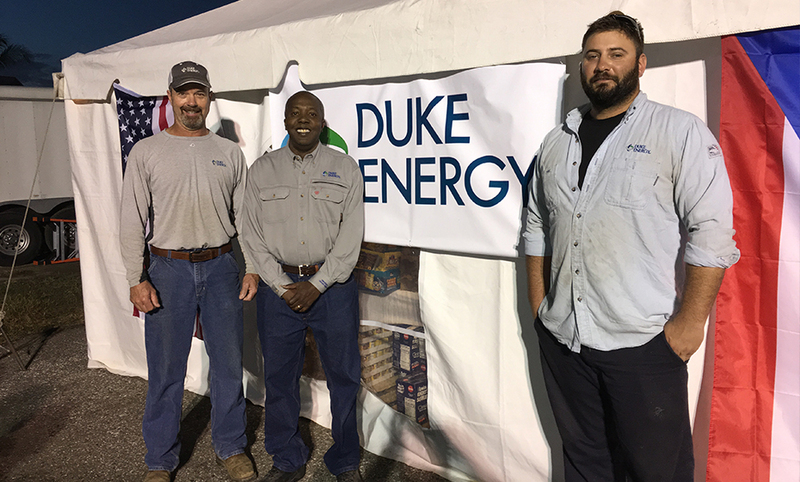 Duke Energy employees Mike Haynes, from left, Rufus Jackson and Craig Mustard in Puerto Rico. Mustard said his daughters are proud of their dad. As tough as the work is, he said it was tougher to leave behind Brooke, 7, and Brynn, 6, and his wife, Katelin.